Now available for DE3 and DE4 Dev Kit! 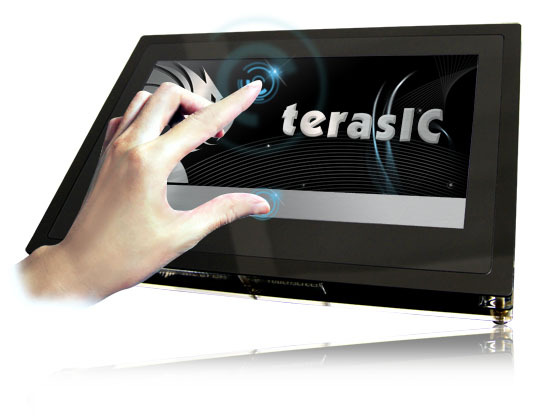 The Terasic Multi-touch LCD Module (MTL) is an all-purpose capacitive touch-screen for FPGA applications and provides multi-touch gesture and single-touch support. An IDE cable with an IDE to GPIO adapter (ITG) is used to interface with various Terasic FPGA development boards through a 2x20 GPIO interface on the MTL. The kit provides everything you need to develop multimedia applications using a digital multi-touch panel and includes complete reference designs and source code for implementing a photo viewer demonstration and a color painter.